Germany established its energiewende policy so as to cut CO2 emissions 40% by 2020, and 80%, or more, by 2050. 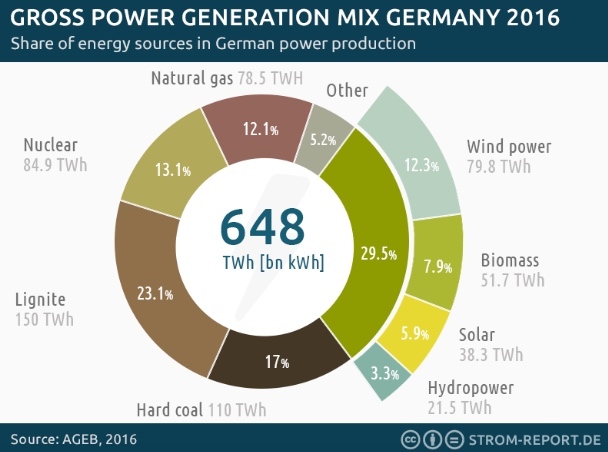 According to the German AG Energiebilanzen, renewables accounted for 29.5% of Germany’s electricity production in 2016. This is higher than most countries, except for those that get most of their electricity from hydro. Fortune magazine did note, however, that the costs have been huge. While Germany has spent billions of dollars to subsidize wind and solar energy, the results have not been very good. To achieve this penetration by renewables, Germany spent $26 billion in 2016 alone. While the concept of energiewende goes back decades, it became institutionalized in 2000 with the establishment of feed-in tariffs for renewables with the Renewable Energy Act. The cost of energiewende must include all the costs since 2000, so $26 billion is the tip of the iceberg. The cost since 2000 has been at least $100 billion, and is projected to reach over $500 billion by 2025, according to a report commissioned by the Düsseldorf Institute for Competition Economics (DICE). It’s noteworthy that the average German is paying 3 to 4 times more than the average American for electricity. The chart of GHG emissions prepared by Green Energy Wire shows that reductions have stalled over the past several years. The level of GHG, as CO2 equivalents, in 2009 were 907 million tons, while they were 906 in 2016. It’s also possible that things will get worse as Germany shuts down its remaining nuclear power plants by 2022. The German Economic Ministry (BMWi) has warned the country is in danger of missing its 40% target, three years from now in 2020. 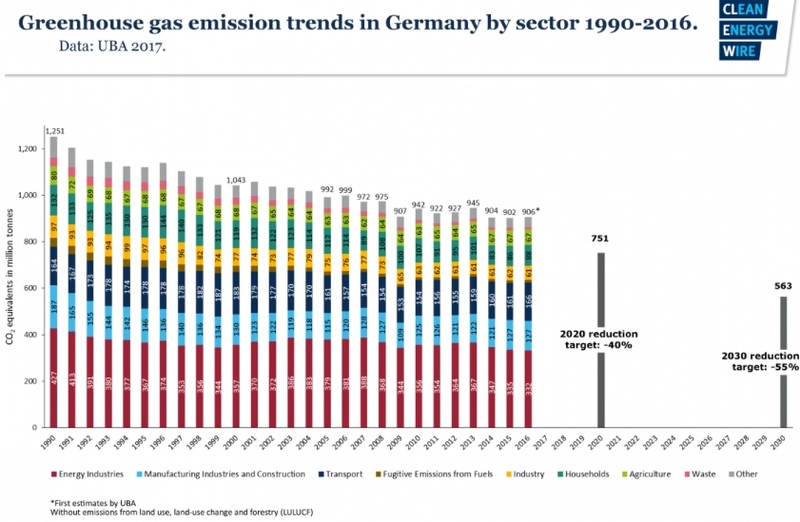 To what extent has Germany cut CO2 emissions? The target is 40% by 2020, and 80% by 2050, below 1990 levels. CO2 emissions have been cut by only 27% since 1990, with possibly half of these reductions being the result of East Germany’s collapse with its inefficient industries. Measured this way, Germany’s 16 year-long energiewende efforts have been an expensive failure. Thanks Donn for another informative article. It escapes me to understand that so many of the world politicians cannot see the obvious problem with the costly and unreliable renewables they are mandating. It especially hurts the poor. Meanwhile the same crowd is pushing for electric cars which will make things even worse. Extolling Failure | SMIPP Ltd.
Weekly Climate and Energy News Roundup #266 | Watts Up With That?